Sean and I finally had our first Family Visit. It was what we have been hoping for and talking about for over 4 years. When we first got together in 2013 Family Visit wasn’t even a possibility for those with Life Sentences, but luckily for us things have recently changed. February 17 2017, days after we signed our wedding papers, came the law bringing back Family Visits for Lifers. We had already planned to get married and this was the best wedding gift we could have asked for. I went into the belly of the beast (Corcoran Prison) the morning of October 11 and it spit me back out first thing in the morning on October 13. We spent the entire time together, no officers, no restrictions other than the Family Visit guidelines. It was our first time together just us. We were put into what looked like an apartment with a small front yard that locked us in completely. There was a living room with a couch, clock radio and a TV, a kitchen with just the basics, a bathroom, two bedrooms, and lots of windows. We were in heaven. On our 2 month wedding anniversary, October 12, we woke up together for the first time ever. It felt like a dream. The chilly ‘counts’ from the early morning now behind us, we lingered in the warmth of the bed soaking in the new-ness of this experience. When we got up we worked on making breakfast. We had created a menu beforehand and ordered all our food through a package company. The prison had only given us one large cooking pot and one small sauce pan, one mixing bowl and two big cooking utensils, so we figured out the dynamics of cooking together with these limited items. I boiled water for our tea, Sean washed the dishes before we used them to make sure they were clean. I can still see him in the blue plaid PJ pants and white t-shirt, it all felt so normal. I cracked the eggs and poured them into the small sauce pan. Sean worked on cooking them while I prepared the French toast. He shined with happiness, finally getting to cook something after 14 years of prison. 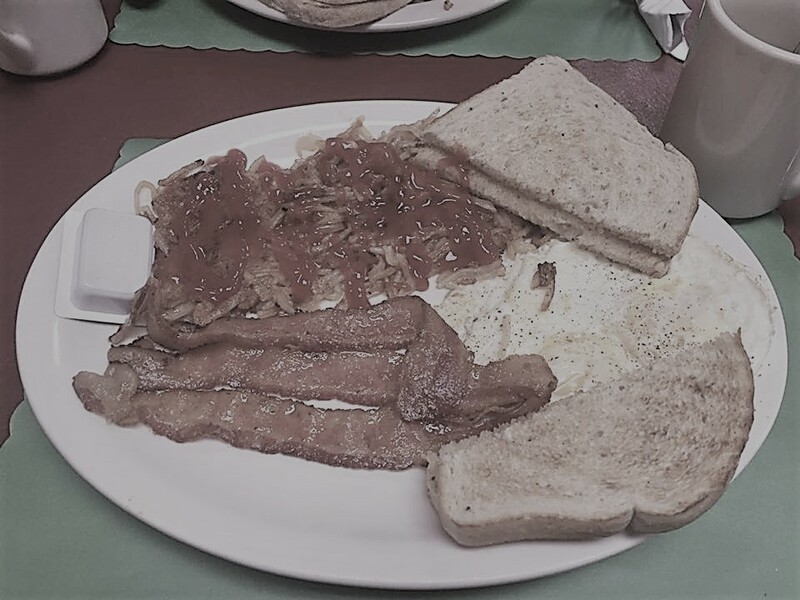 I remember Sean wrapping his arms around me as I stood at the stove with the spoon in my hand, French toast nestled into the bottom of the big cooking pot, bacon sizzling in the smaller one. (Pre-packaged pre-cooked bacon, but bacon none the less!) “My wife is beautiful when she cooks.” he said. We couldn’t stop smiling, reminding each other that this was real. We down sat at the table with sunlight streaming in through the windows. I watched the delight on his face as he took the first bites of his breakfast. It was the second “real cooked meal” he had in 14 years; the first had been the dinner we cooked together the previous night. He devoured his breakfast and wanted more; I was happy to cook again because it felt so good. It felt right. “Will you be my wife forever?” he asked me as we made breakfast for the second time. “Of course” I answered. I have never felt happier. We both agreed it was the best day of our lives besides our wedding day. Later, a familiar song came on the radio and I called Sean over excitedly. We faced each other to slow dance like we had been the previous day and when the lyrics started we both began to sing. We both knew every word to Tim McGraw’s ‘Live Like You Were Dying’. It was such a special moment and we have both said since then that we will always treasure it. It is meaningful to us. We experienced the most freedom we have ever had together, the most freedom he has had in over 14 years. The best thing to do was embrace it and literally live as if we will never get to do it again. To make every moment count. Sean’s note says: In this same way, husbands ought to love their wives as their own bodies. He who loves his wife loves himself. Ephesians 5:28 Sean’s doodle of us at Family Visit looking at the moon. This entry was posted in life in prison, wrongful conviction and tagged breakfast, Family Visit, Garth Brooks, life without parole, love, marriage, moon. Bookmark the permalink.